"I've been making this for years, and use whatever I have left over from Thanksgiving dinner. No one cares about the turkey dinner. They make me do the turkey so I will make the burritos. This recipe calls for instant flour, formulated to dissolve easily in liquids, and primarily used as a thickener in gravy recipes. Chicken broth can be used in place of turkey broth." In a large pot, combine turkey, stuffing, mashed potatoes, gravy, broth, and onion. Bring to a boil, and cook until onion is soft. Thicken with flour if needed. Warm tortillas in a dry frying pan over medium heat. 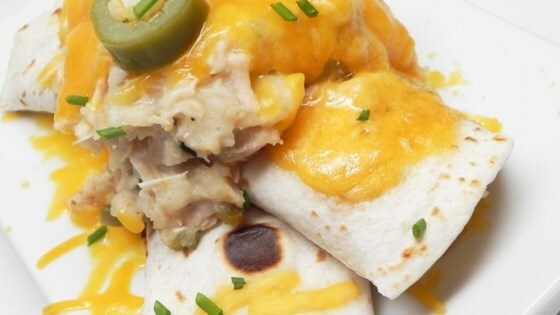 Spoon turkey mixture onto a warm tortilla, sprinkle with cheese, and roll into a burrito. Repeat with remaining ingredients. Spread more cheese on top and add another spoonful of the turkey mixture over the cheese. Garnish with jalapeno slices, sprinkle with jalapeno juice, and season with salt, pepper, and parsley. Serve hot. Use what you have leftover from Thanksgiving dinner. Make it heavy on the turkey and lighter on the potatoes, dressing, and gravy. It's not supposed to be real thick. Any type of shredded cheese will work in this recipe. Did you know Allrecipes is home to over 400 crock pot recipes? Click here to visit our complete collection. This was a great recipe to use when you had all the left over turkey from the holidays! These were just okay - kind of like turkey mush wrapped in a tortilla. Needs some chilis or spice - but I'm not sure how. Probably will find another use for the leftovers. I like the idea of this recipe, but two quarts of broth is just far too much. I haven't yet made this successfully, but will try again, with less broth and more solid items.